Pictures about the line you'll find on the WP&YR website: http://www.wpyr.com/explore/scenerytype.html. In the year of 1896 gold was found in Canada’s Yukon in the side streams of the Klondike River near where it flows into the Yukon River at what is now Dawson City. Thousands of adventurers followed the call of gold. The city Skagway was founded and became the gateway to the gold fields at the Klondike further north. But the way to the gold fields was a real challenge. It was a dice with the dead, any many lost. From sea level the trail winded up to an altitude of more then 2.900 ft. It took some 40 miles before the future gold miners reached Lake Bennett, but from here it was another 500 miles to the gold fields. Just two years after the Gold Rush began they started to build a 3 ft narrow gauge railway line from Skagway to the north. Thousands of workers built the line through the mountains under very difficult circumstances. En route they built what at that time was largest steel railway viaduct, an impressive cantilever structure that although out of use still stands. In August 1900 the 110 miles long line was opened up to Whitehorse on the Yukon River. From there those going to the gold fields usually took steam powered sternwheeled steamers down the river to Dawson City. 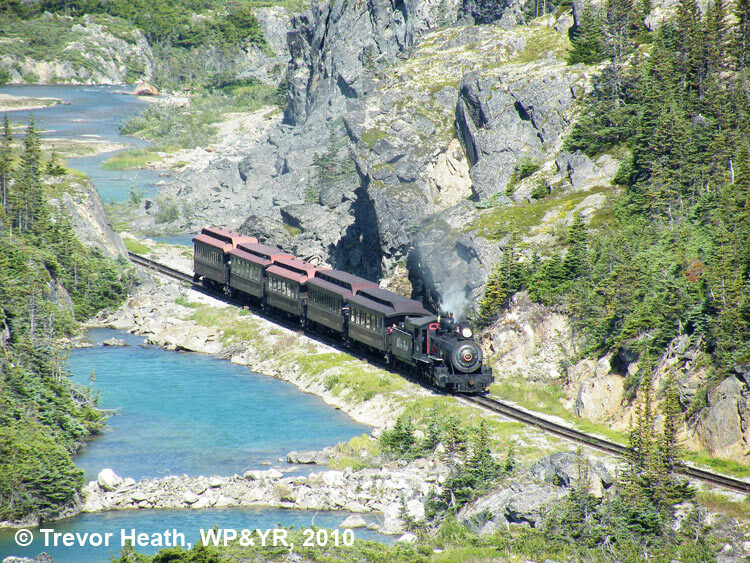 The White Pass line is very spectacular and is definitely among the most scenic railroads of the world. In 1982 they closed the line. 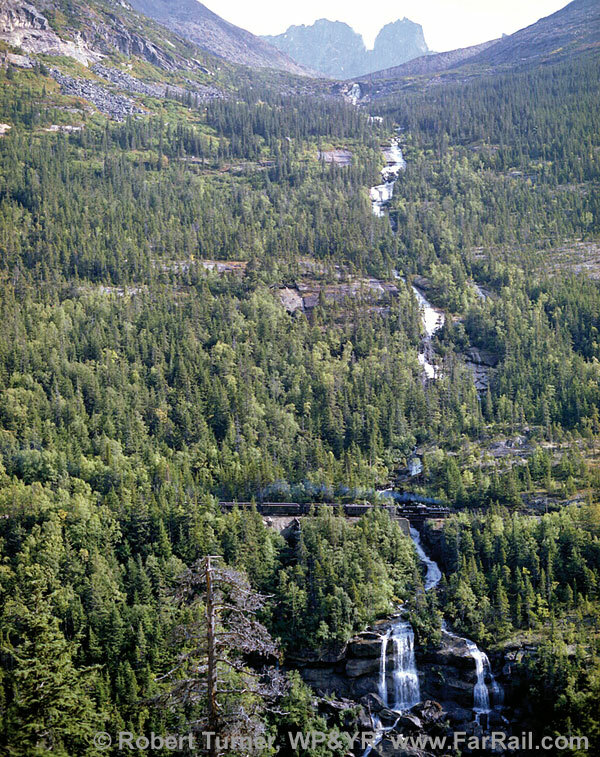 But the tourism to Skagway was rising, and so it was possible to re-open the line for tourist trains in 1988. Since then they have overhauled two steam locomotives and it retains many early passenger coaches and some early freight equipment, some of it going back to the Gold Rush era. 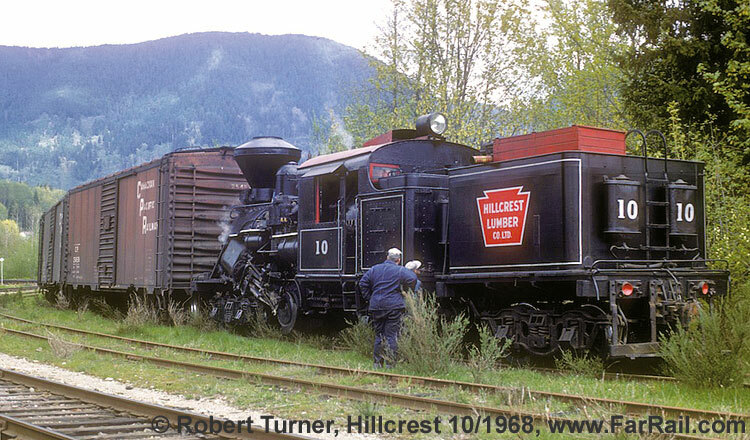 The White Pass pioneered the use of container equipment on its freight trains, and examples of those cars can be seen too. The line uses 1950s and 60s vintage General Electric diesels and Montreal Locomotive Works diesels from 1969-71. Some of the newer engines were sold for use in South America after the line closed, but were later brought back to the White Pass. They also have one newer diesel built in 1982 by Bombardier, the successor to Montreal Locomotive Works. The White Pass bought equipment from many other narrow gauge railways over the years and you will see passenger or freight cars from the Sumpter Valley, Colorado & Southern, and a number of others. We will try to use as much early equipment in our trains as we possibly can. It’s not only the beauty of the line and the mountain scenery around, it’s also the amazing light conditions which makes a trip to this area especially interesting. In mid-June, the sun rises at 4.30 am and sets not before 11.30 pm! Light will come in corners of the valley, which are hidden by dark shadow of the mountains almost the entire year. But the sun is not rising high above the horizon, making excellent conditions for photographers and video film makers! Morning arrival Vancouver, continue by 4N 506 to Whitehorse 11.30  13.55 hrs, transfer to our hotel in Whitehorse. Optional visit to historic sternwheeler SS Klondike and/or Yukon Transportation Museum. Whitehorse also has a restored Oporto trolley running along the riverfront. In the early morning we’ll go by charter bus to Carcross. Welcome ceremony at Carcross. Here we will board a charter diesel train from Carcross to Skagway. In Bennett we’ve planned a dinner before we continue through the bright artic evening to Skagway. Hotel in Skagway. 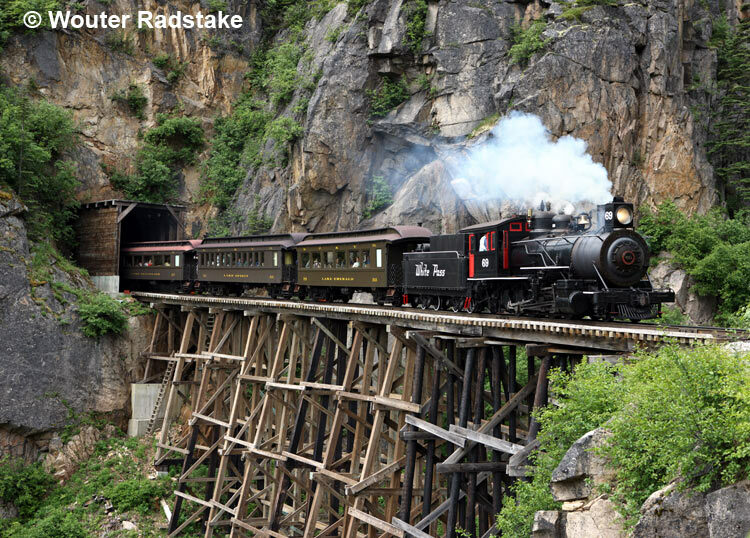 We’ll climb up the gradient to the White Pass with a steam hauled mixed train to Fraser Meadows. Many runpasts are planned en route. For our return train we’ll turn the locomotives because there are many photo and video opportunities on the way back to Skagway as well. Hotel in Skagway. Flight AC 290 to Vancouver 14.00  16.20 hrs. From there we’ll continue to our hotel in Port Alberni on the west coast of Vancouver Island. The tour is suitable for the demanding photographer and video film maker (who is not too sensitive to noises produced by photographers) as well as for spouses and girl friends. Although the sun is rising very early it’s not necessary to get up that early. Because many parts of the line are covered in the shadow of mountains we’ll not start in the middle of the night. However, two early morning starts are planned as well. Along the line there are no restaurants or diners, we’ll serve you a box lunch each day. It doesn’t hurt to take some snacks along. Most things for a living need to be brought in by ship or air, or a very long truck haul over the Alaska Highway. That’s why prices for food and accommodation as well as the price for our trains are well above the usual US-standards. Because in a group we’ll enjoy a little discount we’ve included breakfast and dinner in our hotel in the tour price. If you want to make a dinner somewhere else in Skagway please expect prices from 35 US-Dollars onwards for a proper meal. Good beer is available too. We’ll be a large group on this trip and everyone will have to be responsible for being ready for train departures. The exact train departures will be announced every day. But you need to make sure that your alarm clock is set properly and you’ll be on time on the platform. We can’t delay the train by searching for someone who missed the morning call. Anyhow, if you want to stay on for a day or two to explore the gold miners city on you own, please give us a short call. Travel in the Yukon is pleasant and rewarding, and a drive along the Alaska Highway or the Klondike Highway to Dawson is always beautiful. We’ve booked the Westmark Hotel in Skagway and in Whitehorse. 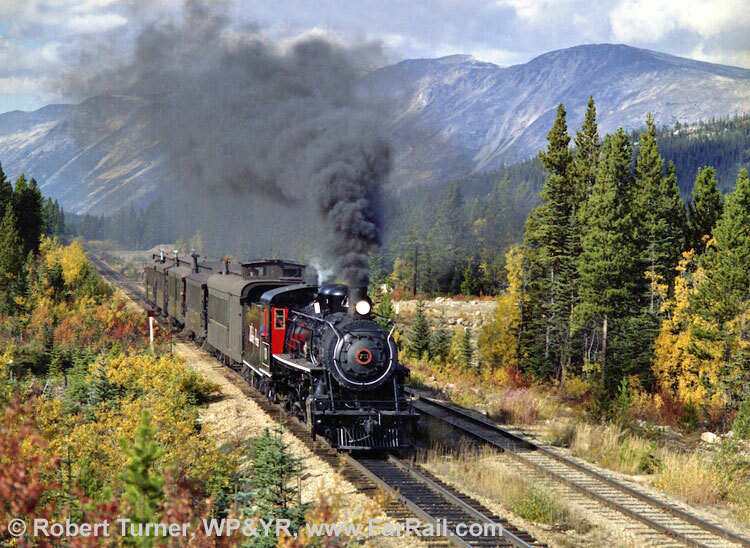 From the hotel in Skagway you can reach the railway station in less than five minutes by foot. So we didn’t order a charter bus for these transfers from the hotel to the station. Our extension will offer you some non-standard locomotives: a Baldwin saddle tank loco in Port Alberni and a Heisler and Climax at Mt. Rainier. All three are former logging railway locomotives. Both railways have a lot of other interesting railway equipment, including other locomotives, available for viewing and photography. The McLean Mill also has many vintage vehicles and logging machinery on display. 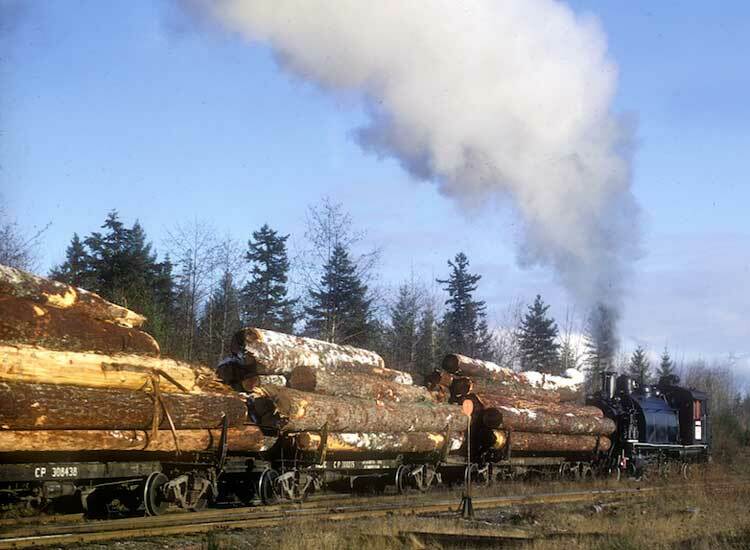 This includes an operable steam donkey engine used in logging. 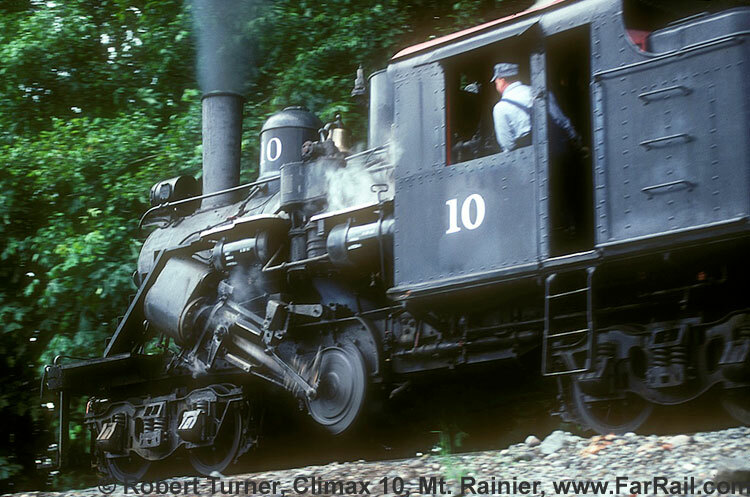 Our last event will be a relaxed dinner in a steam hauled train on the Chehalis Centralia RR. The tour was planned with Doug Cummings who has visited the line frequently. He’s in contact with the railway people and knows them well. What we’ll offer here has never been offered before, and it took quite a while before we could set up the program as it is. They never worked so many steam trains over the line within five days. They had their steam trains, of course, but they never ran three of them within one week, and they never used both of their locomotives on consecutive days. We pushed the railway people to their limits and tried to make the most out of it. But for several reasons some arrangements are not possible. Of course we asked for more steam trains and less diesel trains  but this turned out being not possible. The program was only possible in the way we arranged it, cutting off diesel trains from the program was no option either. But you can be assured that this program will offer the most possibilities available at this time. On the other hand, the vintage diesels are a must as well. Both classes are very interesting and in authentic colours. Some of the smaller Class 90s are now over 50 years old, and are in beautiful condition. If you only want to see the steam trains you can book the steam part only, but there is no discount possible for the unused days. Otherwise we would need to raise the price for those who book the full program. But we need these bookings because without diesel charter trains, there are no steam charter trains. One train yes, but who wants to fly from Europe or Australia just for one steam train? Their resources are limited, especially in the peak season of tourism. Such a tour as we planned could not have been realised without the economic crises and the decline of tourism. Yes, you’re reading correctly: because of the decline in numbers of visitors going to Skagway the railway sees the chance to offer many additional trains in their running season. With the normal number of visitors and charter trains there wouldn’t be a chance to add another six trains, three with steam and three with quite rare and interesting diesels. You need to consider that such an event might not be possible later when the economic situations eases and tourists are flooding Skagway again. At least not in June when the days are long that far north and photo positions are possible, which are in the darkness of shadows of the mountains for almost the entire year. You could only use the days before and after season, when weather conditions in this region are rarely suitable for photographers and video film makers. You need to expect deep snow until May and rain and fog can come back in late September already  before it suddenly can turn into deep snow again. The line offers dozens of superb and spectacular locations for railway photography. 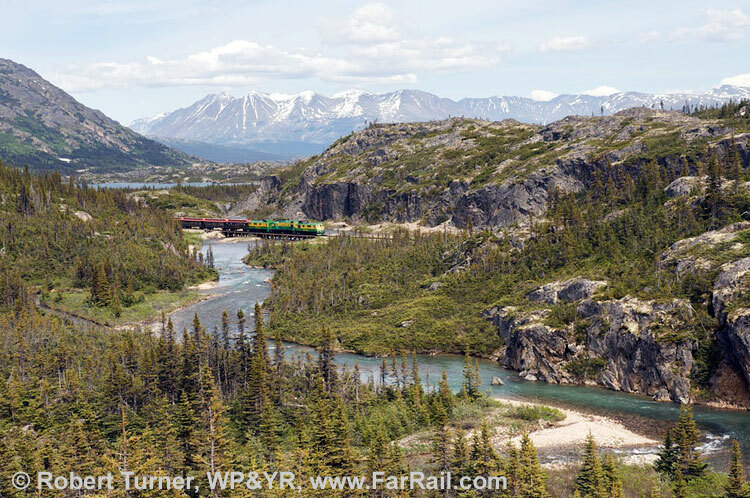 Travelling on the train and looking out of the windows in the breathtaking countryside alone would justify a trip to Skagway. However, some photo positions are good for just 25 people. That’s why we’ll repeat some of the runpasts twice or even three times, so that everyone has a good chance for photos. Most of the spots are good for large groups of course. The huge price we need to pay the railway for arranging this extraordinary event requires a minimum number of 70 participants. We’ll have three guides on the tour to manage everything and give everyone the opportunity for bringing great shots and good memories home from the trip. Of course, at the photo spots a certain discipline is required. We’re not the only train on the line and need to make the most out of the time we have. We want to photograph from about a dozen positions each day. While some of the top spots will be done more than once, other locations will see us only once. We planned different train arrangements. We’ll use both serviceable steam locomotives, nos. 69 (2-8-0) and 73 (2-8-2), and two different diesels. It is negotiation to get rid of the 1890’s style headlamp of no. 69, but we’re not too optimistic we’ll get this problem solved. Hence we’ll take no. 73 with a smaller headlight twice and no. 69 for the other steam charter train. The itinerary might be altered from the published one to make the most out of the opportunities. It can’t be promised that everything will run as planned and paid for. Keep in mind it’s a challenging mountain line where trees or rocks can fall on the track and almost every spare part for a locomotive needs to be delivered by ship. Although the condition of the locomotives is excellent, they are still complex machines which might cause trouble. Hence we can’t guarantee the use of a certain locomotive or rolling stock. But be assured that the railwaymen will try their best to make our tour a memorable event. At Skagway there is also a non-operating Rotary Snowplow, and several preserved locomotives including some salvaged from the river bank. The line crosses the border between the U.S. and Canada, which requires you to carry a valid passport. Customs officials are friendly and may even stamp your passport with a locomotive design. The highest temperatures can be expected between plus 5 and plus 25 degrees Centigrade. In the morning temperatures may drop below zero. In the mountains the weather can change without a warning. We require a firm booking from anyone wishing to come, as early as possible. We have limited space and we will require a deposit of £250/€250/US-$370.00 per person no later than May 31st, 2010. We have to make a substantial non-refundable payment to the railroad one year before the trip runs. If you are sending in a deposit please date your cheque for June 1st, 2010. Deposits will be paid back in full if the required number of bookings has not be reached. You’re travelling on your own risk. Always use common sense when crossing roads and railway tracks. FarRail Tours cannot be held responsible and will not accept any liability whatsoever in the case of any accident or damage. We suggest you take out a comprehensive overseas accident and health insurance policy. In Port Alberni and Mt. Rainier we’ll travel in freight trains with no seats. We have about 15 seats in each train only. We need to sign a paper which states that the railways do not held any responsibility and will not accept any liability whatsoever in case of any accident, damage or disadvantage. According to the immense changes in the exchange rates just recently we’ll price the tour in two currencies: The land only part in US-Dollars and the flight in Euros or Pounds. Port Alberni, Mt. 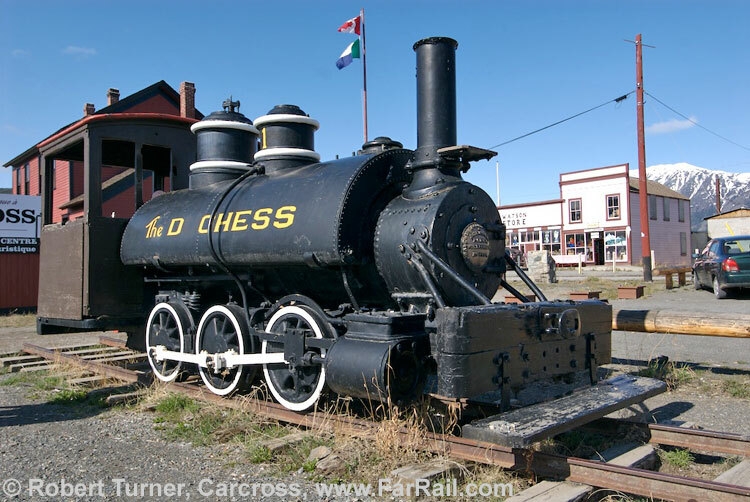 Ranier and Chehalis Centralia RR: Breakfast only plus BBQ Hamburger lunch (no steak) in the McLean sawmill as well as dinner in the train of Chehalis Centralia. Beverages are not included except wine in the dinner train on the Chehalis Centralia RR.